If you are thinking about attending one of our courses for the first time you might be wondering if the workshop will be right for you. With that in mind here’s a rundown of what to expect when you attend one of my events. We want to offer you a really great experience on our courses. It’s not like a client evening at a veterinary practice where you are crammed into a tiny room, nor is it stuffy and intimidating. I want you be to able to relax, feel comfortable and enjoy the full day (or half day) of learning that you are going to experience. As a horse owner and rider I have spent many hours in cold portacabins and freezing indoor schools on training days. Quite often I have been so cold and uncomfortable that I have been really distracted from what I am trying to learn. 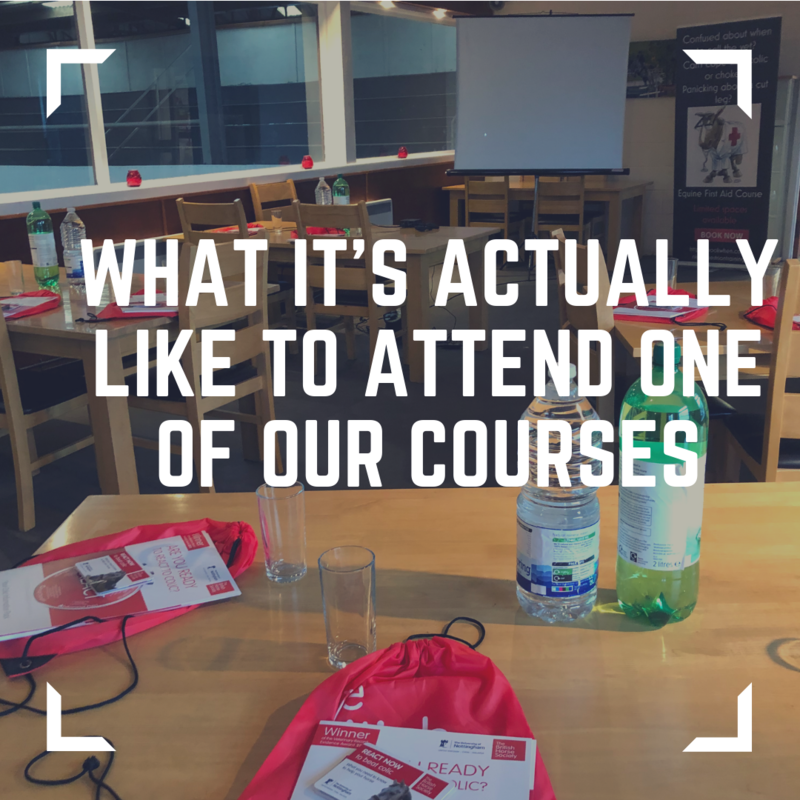 For this very reason you will find that our courses are held in a mixture of hotels and meeting rooms, largely not on a yard. We do sometimes have the privilege of using really good quality training spaces at equestrian centres but we hand pick these to ensure human comfort. It is really nice not to need to arrive for a classroom based day of learning in full thermals, wellies and yard boots and I know that our delegates really appreciate this. There is nothing worse than walking into a room full of people that you don’t know, but I try to encourage people to participate in my Facebook community. We do keep our group sizes to under twenty five people, and everyone is a horse lover. You can rest assured that you’ll be met with a friendly face (me, or one of my fantastic team Jen or Chloe), tea, coffee and some sort of sugar based snack (fruit and healthier options are also available). I send out two emails before the course, one on how to prepare for the course, and one with all the details about the day. We try and provide you with as much detail as possible from where the course is being held, where to park your car, what to wear and an outline about the day. I have also created other content to help you before an course. On our courses all the training is delivered by qualified vets, and I work very hard to ‘vet our vets’. I handpick all the vets who speak on our courses and we have several briefing calls about what’s expected of them. I want our vets to be delivering clear messages, and to provide maximum value on the day. All our vets are well paid for their time on the day, and I really value their expertise and experience. The vast majority of our vets hold extra certificates, and they are all very committed to developing their knowledge. I also try and work with vets who ride, either they have ridden a lot in the past or they do still actively ride. Whilst riding it’s a necessary skill for the workshop I think it is really important that our speakers understand what it is like to be a horse owner, particularly in a stressful time such as when your horse has colic or choke. I also select vets who are passionate about helping horse owners, and their enthusiasm certainly shines through on the day. I have certainly been on many training days where you leave buzzing with many great plans and ideas, but the next day life takes over and you never quite get these things in place. This is NOT what I want to happen when you attend one of my courses. Immediately after the course you will receive an email containing the slides from the course, and some other helpful information. A few days later you will get another email with some suggestions about how to follow up after the course. If you have attended our Horse First Aid Course this might include getting your horse first aid kit in order, taking your horse’s temperature or improving biosecurity on your yard. A week later you get another email with all the details about arranging a yard visit to get your horse weighed, and you then receive subsequent emails urging you to create an emergency plan and top tips to reduce your horse’s risk of infectious diseases. Now this might sound like a lot of emails, I’m not trying to hound you or fill up your inbox, I’m simply helping you to follow up after the course. I want you to get maximum value from attending our workshop, and I love it when owners tell me about what they have put in place after a course.